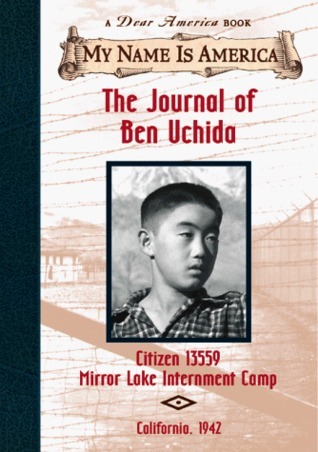 The Journal of Ben Uchida, Citizen 13559: Mirror Lake Internment Camp, California, 1942, Barry Denenberg, 1999. I trash on Barry Denenberg a lot because I don’t care for his characterizations of young female characters, and also because I tend to get frustrated with “old white man writes young women and characters of colour.” This falls into the latter category, and I wish so much that Scholastic had come up with an actual Japanese author—notably, Scholastic Canada’s similar book managed to do it with Torn Apart, The Diary of Mary Kobayashi, which is an internment diary about a Japanese-Canadian girl, and which actually is written by Susan Aihoshi, and is a significantly better book. But enough about what I had wished this book could have been and let’s get on to what it actually is, which is one of the very few My Name is America books that I actually enjoyed and could probably be enjoyed by a twelve-year-old boy. Probably because it has a healthy dose of actual humorous entertainment value, unlike most of the other books, and unlike most of Barry Denenberg’s other books. Ben Uchida is twelve years old, and in April of 1942 he and his family are getting ready to leave their home. They have no more stuff left, every last stick of it has been sold. A couple of weeks before Christmas in 1941, as everyone knows, Japan bombed Pearl Harbor, scaring the crap out of America. That night his parents burn all of their Japanese things—the letters from their grandparents in Japan, their books, their records, their newspapers, their photo albums, his sister Naomi’s Japanese dolls, every last thing. But Ben’s parents won’t let him stay home from school, so he goes Monday morning to find that everyone is staring at him like he’s a freakshow. Back again to Dear America and one of my very favourites. Unsurprisingly, it is Kathryn Lasky, because she is fantastic, and I’ll say it before and I’ll say it again: she doesn’t get half the credit she deserves. 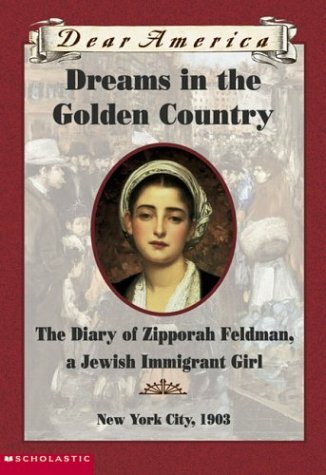 Book: Dreams in the Golden Country, The Diary of Zipporah Feldman, A Jewish Immigrant: New York City, 1903. Kathryn Lasky, 1998. Zipporah, called Zippy, is twelve years old and sitting on a trunk in Ellis Island when we meet her. Tired and dirty, they have just arrived from their steamship voyage and are waiting in many of the endless lines to be “processed.” (Immigration: miserable in every age!) Zippy has two older sisters, Tovah and Miriam, and they are traveling with their mother to meet their father, who has been living in New York trying to afford their passage. Zippy and her family are all tired and miserable, except for Tovah, the oldest sister, who has been running around learning things from the other travelers. She tells them that Jewish women in New York wear their own hair, not wigs, and Zippy thinks to herself that Tovah is a bit of a know-it-all and irritating smarty-pants. But Tovah is the one who saves her—when Zippy gets tagged with an E for having red eyes from irritation, Tovah turns her coat inside out and the family are all processed together. Not only was this book a very fond memory for me, it’s held up remarkably well in the fifteen years since it was published, and it’s really a hidden gem. Probably suitable for teens at least fourteen or so, as it has some fairly mature themes, but overall I loved it and I was so excited to find a dirt-cheap copy to review! 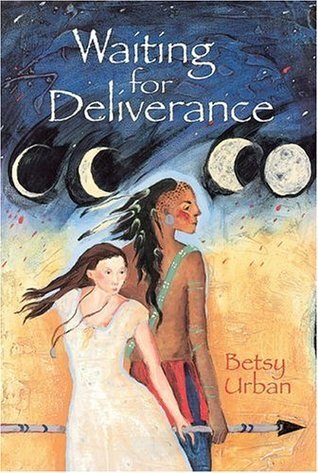 Book: Waiting for Deliverance, Betsy Urban, 2000. Deliverance Pelton, called Livy, is fourteen years old, being “sold” at a Pauper’s Auction with her younger cousin, Ephraim. An orphan who had been living with her aunt, uncle, and cousins, they have just lived through a river disaster where all the others were swept away to cold and watery graves. Now, as they are unable to look after themselves, they are being auctioned off by the county to the lowest bidder, who is obligated to provide them with room and board in exchange for work. (This is not a fictional construct! Pauper’s auctions were not common, but not unknown in New England and today’s New Brunswick during the colonial period.) Livy is horrified to find her and her cousin in this predicament, and even more horrified to see the gross old men bidding for the privilege of, essentially, buying her. When one particular gross old man kisses her, she clocks him and lays him out, to the applause of all and sundry. This is about the last enjoyable moment Livy is going to have for a while, because a man wearing deerskins with filthy hair bids a shilling per month for both Livy and her cousin. This obviously being the lowest bid, they are packed off with the man, Gideon Gunn, to his homestead out in the woods somewhere. Livy is not pleased to see this development, to vastly understate things. Gideon takes them to a waiting canoe where a young native guy is keeping an eye on things, and they nearly have to hog-tie Ephraim to get him into the canoe. PTSD, what’s that? The young man is named Rising Hawk, and he is going to get important. Why put off until tomorrow, etc., so let’s get started with the oeuvre of one of the Greats, the Big Names of 80s-90s-era historical fiction, the woman who was on every library shelf and in every school classroom at some point, one of the big kahunas herself: Ann Rinaldi. 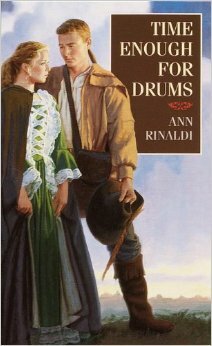 Book: Time Enough for Drums, Ann Rinaldi, 1986. This may not be one of Rinaldis’ absolute most popular books, but it was one of my favourites. This may or may not have been because Jemima, the protagonist, was wearing a gorgeous dress on the cover. Jemima is fifteen years old and living in Trenton, New Jersey, in 1778. She clashes almost immediately with her strict tutor, since rather than go to her lesson, she was running around in the woods getting her older brother to teach her how to fire a musket. Her older brother Dan is in charge of the local militia, and seems to spend most of his time in the first half of the book looking to recruit men while looking very dashing in his officer’s uniform. John Reid, Jemima’s tutor, is twenty-four and a staunch Loyalist, as well as the local schoolmaster. Jemima’s parents were good friends with the Reids, which is why I suppose they continue to engage him as a tutor for their daughter while holding vastly different ideological views.